Computer controlled manufacturing and sewing process guarantees a costume that will make you look and feel great! Our goal is perfectly sized costumes! On the RARE occassion that a costume does not fit, REMEMBER that Pirate Costume EXCHANGES are NEVER a problem. Restocking fees apply to returns. Note: Many of our costumes have elastic bands that are quite forgiving. 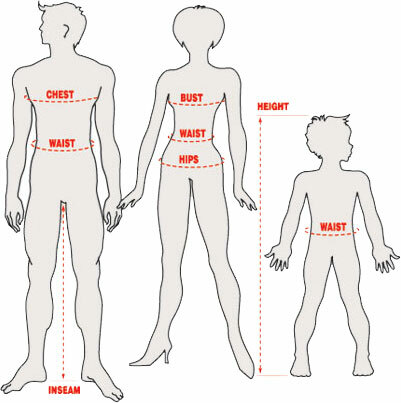 Note: This is our general sizing chart. For a more specific, detailed sizing, please use sizing chart link for an individual costume (on costume info page).